Having your baby in your arms is one of the best feelings in the world, isn’t it mommies? Your little one depends on you for every single thing, and while this is of course a great feeling, sometimes, as a parent, there are situations where you may feel helpless and scared yourself. Seeing your newborn gasping for breath is one such very distressing moment. Well, if your little one has gone through the same, rest assured, it is a normal occurrence. What you are seeing is probably a case of Transient Tachypnea. 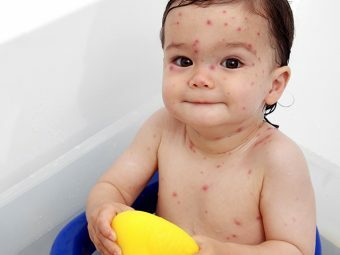 As per facts available, around 1% of the new born babies develop this condition. Transient Tachypnea can be defined as a respiratory disorder that is observed in the newborns, who experience difficulty in breathing in the first few hours after birth. It may occur in preterm and full term babies. The very name Transient Tachypnea means ‘for a short duration’ as in the name “Transient” and ‘brisk breathing’ as in the name “Tachypnea.”. 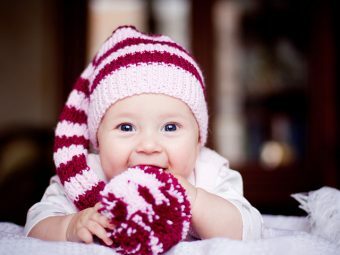 Usually, babies with the condition of Transient Tachypnea take around 60 or more breaths in a minute. In the womb, the fetus does not use the lungs to breathe as oxygen is supplied through the placenta by the means of blood vessels. Thus, the lungs get filled with a special kind of fluid that is produced in the lungs and aids the growth of the lungs. During labor, the liquid is pushed out as the baby passes through the birth canal. However, there might be traces of the liquid left. After the birth, as the baby breathes in rapidly and takes in more amount of air, the liquid oozes out. However, if the liquid leaves the lungs slowly or does not come out during the process of birth as in the case of C-sections, then the baby experiences difficulty in breathing and suffers from the condition of Transient Tachypnea. This condition is short lived and a baby becomes perfectly normal within 24- 48 hours after birth. If the condition does not improve post 48 hours then medical intervention might be required. Some of the common reasons that a baby might develop Transient Tachypnea are as follows. If the mother has pre-medical conditions of diabetes or asthma. The process of cord clamping being delayed. Excessive weight of the baby. If the mother has been administered excess of fluid. 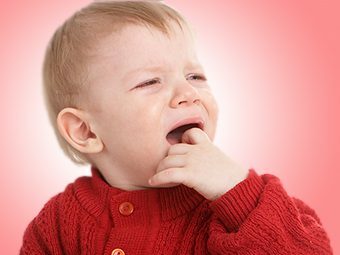 In addition, this condition is mostly prevalent in baby boys. Here are some of the commonly observed symptoms of Transient Tachypnea. 1. Brisk breathing at the rate of 60 breaths or more per minute. 2. During exhalation of breath a sound of grunting or moaning can be observed. 3. Pulling of the skin between the ribs and the ribcage or occurrence of retractions. 4. The skin around the nose and the mouth develops a bluish tinge or development of cyanosis. 5. Nostrils appearing as flaring or bulging. The doctor might conduct an X-ray of the lungs to detect traces of fluid present in the lungs. A small piece of tape might be fastened to the leg or hand of the baby. The performance of the lungs is monitored on a computer where the doctors observe if the lungs are sending enough oxygen to the blood. This process is known as Pulse-oximetry. At times, a blood test is required to check the levels of oxygen. Alternatively, a Complete Blood Count may also be done by taking blood from the heels or one of the veins of the baby. Here mentioned are some of the steps for transient tachypnea of the newborn treatment. 1. Usually the symptoms of Transient Tachypnea go away on its own within 24 to 48 hours after birth; however, in severe cases the baby might have to be put on ventilator support. 2. 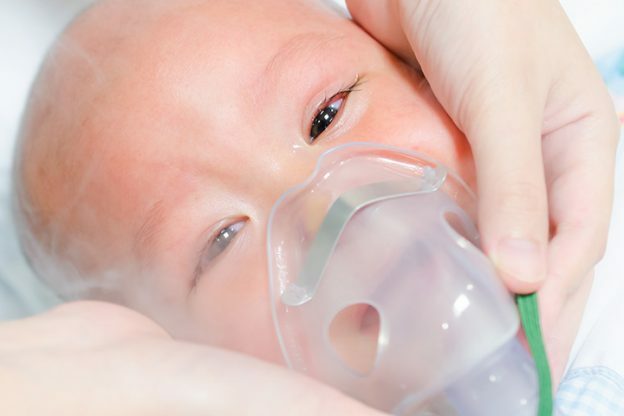 In cases where the condition is not that severe, a supply of oxygen through an oxygen cylinder or an external source aids the breathing of the baby. 3. Babies are also given a supply of oxygen through a tube that is placed under the nose of the baby and is attached to a breathing machine. The airways are kept open by the continuous flow of oxygen from the machine. This is called the CPAP or Continuous positive airway pressure. 4. Babies are given supplementary fluids, electrolytes or glucose by means of IV fluid as they might find it difficult to nurse or be breast fed if they have respiratory issues. Also, antibiotics may be administered to them through an IV or Intravenous fluids. 5. Occurrence of Transient Tachypnea is very normal in the newborns and timely medical attention can help solve the discomfort of the baby within a few hours. We of course understand how difficult it will be for you to see your baby in such a condition. We hope the information shared here will aid you identify the symptoms immediately, helping you get medical attention for baby immediately. 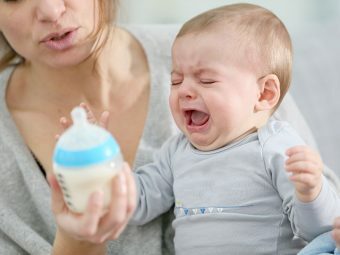 In case your baby suffered the same issues too, do share your experiences here to help out other mommies.